I have always been proud of my thick black hair. During my twelfth standard I had grown my hair long enough to brace my hips. My hair was the talk of the town, family and college. Thick, straight and jet black. I could do any hairstyle I wanted to and my hair was my best feature. But soon college was over and I had to go to Chennai for my work training. Having been born and brought up in Bangalore, Chennai came as a rude shock to me. The place, the people, the weather, the water, the food; I had problems with everything. But what I hated the most was what it did to my hair. The weather is constantly humid and sticky, making my hair feel oily all the time. The water was so bad, that it left my hair all dull and limp. Thanks to the sticky weather I had to wash my hair everyday. And thanks to the hard water, my hair lost its shine, thickness and it became all rough and dull. When I came back to Bangalore after four months, my hair was beyond repair. I had no other go, but to cut it. I remember holding my cut hair and crying at the salon. I even carried it in a bag with me. After two days of weeping, I realized how creepy it was and threw it away. I took extreme care of my now shoulder length hair. I oiled it thrice a week, went for spa treatments and used the best of products. The quality of my hair improved to a large extent. The shine and the thickness returned, but the silkiness was gone for ever. My hair had become incredibly rough and difficult to manage. With the help of serums and leave in products I tried to smooth it out as much as I can, but it only gave temporary resolution. Regular visits to a salon for a hair spa helped my hair a lot. Thankfully I did not have any hair fall problem. It was only about the roughness. I have a severe migraine problem, because of which I cannot tie up my hair. No matter how long, I have to let my hair loose all the time. Else I end up with a splitting headache. This only adds to the already existing problem. On top of that I regularly blow dry my hair and straighten it on occasions. Earlier no matter what I did to my hair, its quality remained the same and I was so proud of it. I had once colored my hair red and it still held on to the shine and silk like texture. But a brief stay of four months in another city, took away my prized possession from me. People still love my hair. It looks really brilliant I know. But only I know how it feels. The day I wash it, it looks smooth and shiny. But after a few hours, it turns so rough and frizzy that I feel I'm running my hand through some coir threads. I spend so much money on shampoos and serums and yet this problem does not go away. Some shampoos made my hair feel smooth by forming a thin layer on each hair strand which made my hair look like plastic. Some serums made my hair look and feel great, but after a few hours it turns the scalp so oily that I feel icky. I have tried almost every hair product in the market by now, but the roughness refuses to leave my side. So just like everyone else, I'm forced to flaunt hair that looks wonderful but feels rough. 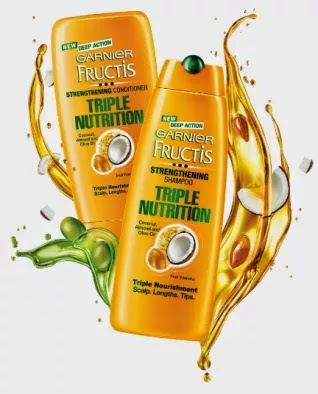 When I heard about the Garnier Fructis Triple Nutrition shampoo, I just brushed it off as any other. I had tried every shampoo from Garnier years ago and the results were always the same. Great looking hair that felt rough. When I received the product for review, I was impressed. It came to me in a single day and neatly packed. The shampoo and conditioner bottles do not have the trademark green color, but are yellow instead. I liked the packaging, with the green font on it. I'm yet to use it though, but the product smells really nice and mild. Thanks to migraine issues I cannot use anything with a strong odour. This one is something that I can use. I have zero hopes from this product, that it will soothe my rough hair. I hope I am wrong here and this one helps me with the problem that I have been facing from years. More about the product and its benefits later. Your hair does look great but only you know how bad you feel when you can't feel the smoothness! I'm almost bald now :( You have lovely hair. Post some pics of your long haired days too! 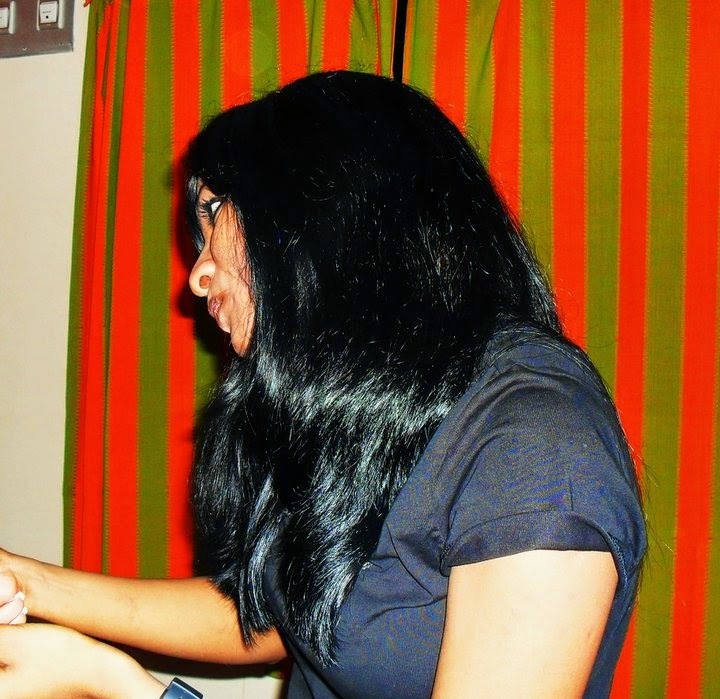 I miss my silky straight shampoo-ad like hair that I had as long as I lived in Kerala and the water was good. I was known for my hair. From the time I left home, my hair has never been the same. I've tried every shampoo in there is. First Hyderabad's hard water ruined it. Now Chennai's humidity is playing havoc with it. During summer times (which is, like, most part of the year) and monsoon, I simply cannot let my hair down (literally and figuratively). My hair looks great and behaves only for a total of two months in a year, which is during the non-summer months here. November and December. Let me know if this shampoo works. I'm ready to try anything. Its so tragic na when external factors does this to our treasured possession. Sigh. Will let you know babe, keep your fingers crossed. You seem to have lovely hair! Like someone mentioned above, would love to see your long hair! You looks great! The length you have now seems right to me. It's flattering on you.